1.In a large frying pan, heat half of oil over medium-high heat; cook chicken, stirring for 6 minutes or until browned. Transfer to clean bowl. Wipe out pan. 2.In a clean pan, heat remaining oil over medium-high heat; cook onion and bell pepper, stirring, for 3 minutes or until softened. 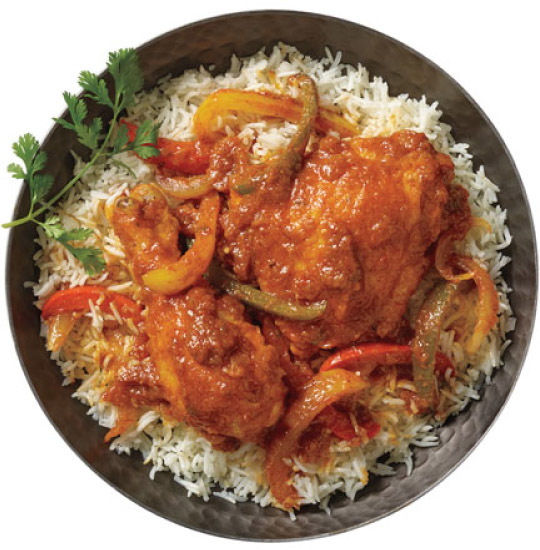 Add chicken and Culinary Tours Vindaloo Cooking Sauce. Simmer, stirring, until chicken reaches an internal temperature of 165°F. 3.Serve over basmati rice with naan.